THIS SECOND EDITION PROVIDES UP-TO-DATE PROTOCOLS FOCUSING ON TECHNIQUES FOR THE SPECIFIC ENRICHMENT OF PHOSPHOPEPTIDES AND PHOSPHOPROTEINS. PHOSPHOPROTEOMICS METHODS AND PROTOCOLS, SECOND EDITION GUIDES READERS THROUGH DIFFERENT LABELING STRATEGIES FOR QUANTITATIVE PHOSPHOPROTEOMICS; HIGH-THROUGHPUT MASS SPECTROMETRY-BASED PHOSPHOPROTEOME ANALYSES AND PHOSPHO FLOW CYTOMETRY; AND BIOINFORMATICS STRATEGIES FOR PHOSPHOPROTEOMICS DATA ANALYSIS AND INTEGRATION. ADDITIONAL PROTOCOLS CONCENTRATE ON THE IDENTIFICATION OF KINASE-SUBSTRATE RELATIONSHIPS BY BOTH HIGH- AND LOW-THROUGHPUT APPROACHES. WRITTEN IN THE HIGHLY SUCCESSFUL METHODS IN MOLECULAR BIOLOGY SERIES FORMAT, CHAPTERS INCLUDE INTRODUCTIONS TO THEIR RESPECTIVE TOPICS, LISTS OF THE NECESSARY MATERIALS AND REAGENTS, READILY REPRODUCIBLE LABORATORY PROTOCOLS, AND KEY TIPS ON TROUBLESHOOTING AND AVOIDING KNOWN PITFALLS.AUTHORITATIVE AND PRACTICAL, PHOSPHOPROTEOMICS METHODS AND PROTOCOLS, SECOND EDITION AIMS TO ENSURE SUCCESSFUL RESULTS IN THE FURTHER STUDY OF THIS VITAL FIELD. This second edition provides up-to-date protocols focusing on techniques for the specific enrichment of phosphopeptides and phosphoproteins. Phosphoproteomics Methods and Protocols, Second Edition guides readers through different labeling strategies for quantitative phosphoproteomics; high-throughput mass spectrometry-based phosphoproteome analyses and phospho flow cytometry; and bioinformatics strategies for phosphoproteomics data analysis and integration. Additional protocols concentrate on the identification of kinase-substrate relationships by both high- and low-throughput approaches. Written in the highly successful Methods in Molecular Biology series format, chapters include introductions to their respective topics, lists of the necessary materials and reagents, readily reproducible laboratory protocols, and key tips on troubleshooting and avoiding known pitfalls. 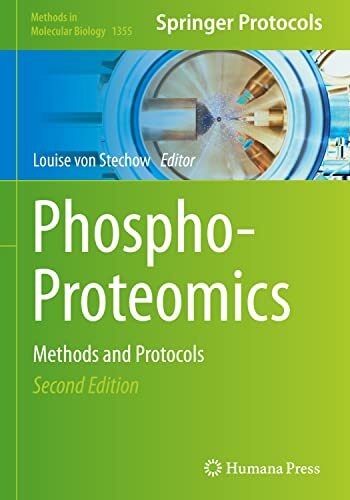 Authoritative and practical, Phosphoproteomics Methods and Protocols, Second Edition aims to ensure successful results in the further study of this vital field.